Fig. 1. DAPI and BrdU labeling of Drosophila ovaries. (A) A low-power fluorescent microscope image of a Drosophila ovariole and stage 10B egg chamber labeled with DAPI. The germarium (germ) is anterior and to the left. The largest nuclei in the stage 10B egg chamber are in the nurse cells (nc), whereas those in the follicle cells (fc) are smaller. (B) The same ovariole labeled with BrdU. Because mitotic and endocycles are not synchronized, some nuclei within an egg chamber are labeled, whereas others are not. In the stage 10B egg chamber, all follicle cells over the oocyte have foci of BrdU incorporation that correspond to amplifying genes. (C) A highpower image of stage 10B follicle cell nuclei labeled with DAPI. The brightest focus in each nucleus is located in the heterochromatic chromocenter. (D) The same stage 10B nuclei labeled with BrdU reveals several foci of different intensities. The two brightest spots represent the amplifying chorion genes. The diffuse spots are amplifying loci in other focal planes. Scale bar for A, B = 100 |im; scale bar for C, D = 10 |im. Drosophila oogenesis, from the division of stem cells to the production of a mature egg, takes place throughout the lifetime of the adult female. Therefore, a second advantage is that a single adult female contains numerous egg chambers representing each developmental stage. Egg chambers are comprised of germ-line and somatic cells. Sixteen germ-line cells, a single oocyte and 15 sister nurse cells, are surrounded by an epithelial sheet of somatic follicle cells (see Fig. 1A). Egg chambers mature within a structure called the ovariole (see Fig. 1A). Each ovary is comprised of approximately 16 ovarioles that typically contain 7 egg chambers at different stages of development. Because egg cham bers migrate posteriorly as they mature, a final advantage is that every ovariole contains an anterior to posterior array of successively older egg chambers. The prelude to forming an egg chamber begins at the anterior tip of the ovariole in a structure known as the germarium, which contains both germ-line and somatic stem cells (see ref. 11 for a review) (see Fig. 1A). A germ-line stem cell division at the anterior tip of the germarium gives rise to a primary cystoblast. This cystoblast undergoes four synchronized mitotic division cycles with incomplete cytokinesis as it migrates posteriorly within the germarium. At the end of these divisions, the 16 cells of this germ-line cyst are connected by intercellular bridges called ring canals. All 16 cells enter the premeiotic S-phase, but only the true oocyte continues meiosis. The other 15 cells become nurse cells and begin endocycles in stage 1 of oogenesis. Endocycles are comprised of alternating S- and G-phases without cell division. The somatic stem cells are located in a posterior lateral position within the germarium (12). These stem cells give rise to a pool of follicle cells that then surround the nurse cell-oocyte complex as it buds off from the germarium to form a stage 1 egg chamber. Fourteen stages of egg chamber development were described by the seminal study of King (13) and have been adopted as the standard nomenclature in the field. During stage 1 to stage 10 of egg chamber development, the nurse cells execute approx 10-12 endocycles and arrest with enormous nuclei that have a ploidy of greater than 1000C (2,6) (see Figs. 1A and 2). This high ploidy supports their role as nutritive cells that supply the oocyte with protein and RNA for early embryogenesis. The nurse cells within an egg chamber do not cycle in synchrony with each other. Therefore, BrdU labeling yields egg chambers that have some nurse cell nuclei labeled and others that are not (see Fig. 1B). Although most euchromatin is replicated during the endocycle, certain hetero-chromatic satellite sequences are not fully replicated and become progressively underrepresented with succeeding endocycles (2-6). In stages 1-4, the nurse cell chromosomes adopt a transient pseudopolytene configuration in which the sister chromatids and homologs are synapsed, but then disperse by stage 6 and individual chromosomes cannot be easily identified thereafter (8). The replicated sisters from each chromosome arm do remain in distinct regions of the nucleus comprising five nuclear domains. 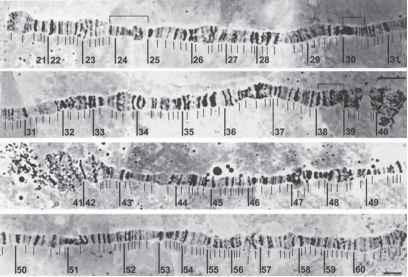 In certain mutant strains, the nurse cell chromosomes remain synapsed and form giant polytene chromosomes that have a distinct banded pattern (14-17; also see Chapter 6). The somatic follicle cells divide mitotically from stage 1 to stage 6. In stage 6, the follicle cells exit the mitotic cycle and enter the endocycle. Nuclear sorting shows that the majority of follicle cells arrest endocycles with a final ploidy of 16C, and BrdU labeling indicates this arrest occurs before stage 10B (6,7) (see Figs. 1A,B and 2). Follicle cells within an egg chamber do not cycle in synchrony with one another during mitotic cycles and endocycles. Therefore, with short labeling, some follicle cells are seen to incorporate BrdU while others do not. During stage 9, most follicle cells migrate posteriorly to form a columnar epithelial sheet over the enlarging oocyte. A few follicle cells remain over the nurse cells and become thin and squamous. Also during stage 9, special border follicle cells at the anterior of the chamber migrate posteriorly in between the nurse cells. Their arrival at the nurse cell-oocyte border marks the beginning of stage 10A. During stage 10A, only a few follicle cells are completing the last enodcycle S-phase and label with BrdU. Stage 10B begins when the most anterior columnar follicle cells over the oocyte begin to migrate to the interior, centripetal position of the egg chamber, which ultimately separates the nurse cells from the oocyte. At the onset of stage 10B, follicle cells begin what amounts to an extended S-phase during which only a few loci re-replicate (7,18). Two of these loci represent clusters of genes that encode eggshell (chorion) proteins. The cluster on the third chromosome amplifies in copy number to approx 64-100x and the one on the X chromosome to approx 16-20x, above the 16C follicle cell genome (see ref. 10 for review, and ref. 19). The high copy number of these two loci supports rapid biosynthesis of the eggshell later in oogenesis. Because most of the genome is not replicating, BrdU incorporation in these cells appears as four dots (see Fig. 1C,D). The two most intense spots represent the two chorion loci, and the two faint spots represent unknown loci that amplify to only low levels. BrdU incorporation continues at the third chromosome locus until stage 13, but the X chromosome locus and other loci have much diminished BrdU labeling by stage 12. In conjunction with the tools of Drosophila genetics, the ability to monitor the activity of these origins by BrdU has been a useful assay for studying the cell cycle control of replication origin activity (see refs. 20,21 for examples).